On Wednesday morning, April 15, a group of women filled to overflowing the spacious living room in Mrs. Howard C. Petersen’s home in Radnor, for the 1953 annual meeting of the League of Women Voters of Radnor Township. 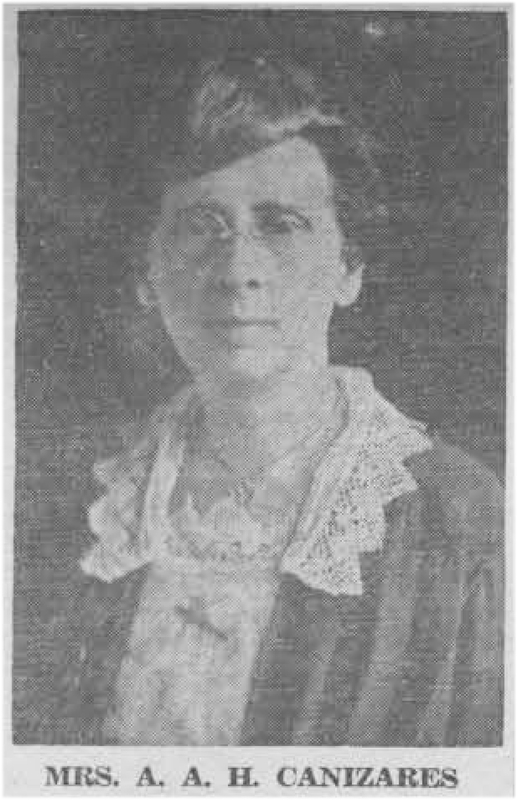 Seated in the midst of this large group of representative women of Radnor township was the woman to whom, more than any other, the local League of Women Voters owes its organization. For it was Mrs. J.S.C. 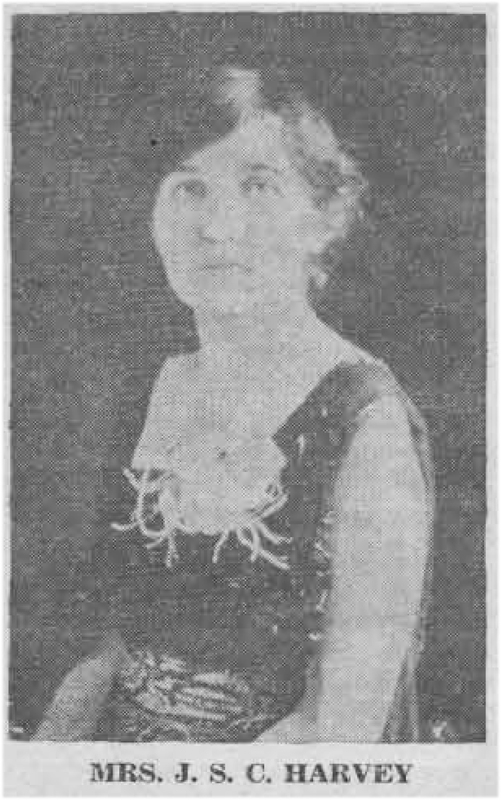 Harvey, of Radnor, who, on August 23, 1920, held an informal meeting, at her home, of a group then known as the Radnor Township League of Women Citizens, of which she was chairman. 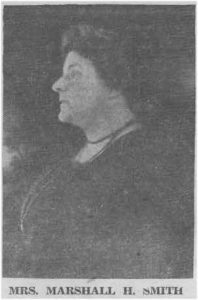 Before the other nine women had left Mrs. Harvey’s home this name had been changed to that of the League of Women Voters of Radnor Township, one of the first small units to be formed in the United States of the National League of Women Voters. The first convention of the National League of Women Voters was held in Chicago in February, 1920. 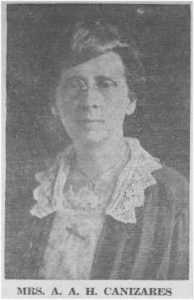 This national organization’s first president was Mrs. Maud Wood Park, a woman experienced in working for the passage of legislation. Almost a year before this in the spring of 1919 Carrie Chapman Catt, speaking to the leaders of the National Women’s Suffrage Association, had proposed “a League of Women Voters to finish the fight and to aid in the reconstruction of the nation.” The “fight” to which she referred was the struggle then almost won for national woman suffrage, while the “reconstruction of the nation” was that of the country’s need in a critical post-war period. During more than 50 years, women connected with the movement had worked slowly but surely towards obtaining the right to vote in individual states. In some few of these states there had been suffrage for many years. And now, at last, a Constitutional amendment would make national suffrage a reality. Those who, like Mrs. Catt and Mrs. Park, had labored long and against odds for this privilege, resolved to make the best possible use of it. And with this objective they pledged a new League of Women Voters as a “living memorial” to all who had helped to bring it about. They set themselves three particular objectives: First that they would strive to educate themselves, the 20,000,000 new voters. Second, they would work for “needed legislation” and third, they would strive to arouse as many citizens as possible to participate in government. Possibly Radnor township did not need this pressure from without to start its women to thinking and planning along League lines. Its inspiration apparently came from within, from such women as Mrs. Harvey and others who already had their “League of Women Citizens.” At any rate the date of their organization as a League of Women Voters follows very closely on that of the organization of the National group. At their first meeting, held in August, 1920, they decided “to hold a general meeting as soon as possible to start an educational campaign, and to try to develop citizenship training classes thereafter.” Their immediate task as they saw it was that of assisting the assessors in registering women for the fall election. And with this in view, leaders for the different precincts were tentatively chosen for this work. Other recruits soon joined the original ten. 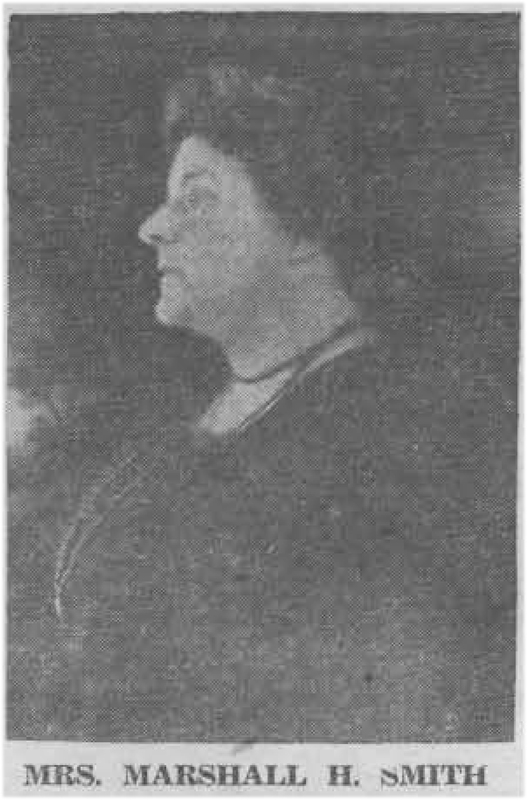 In the beginning Mrs. Harvey was the chairman, and other officers were chosen “protem.” The first regularly elected treasurer seems to have been Mrs. Marshall H. Smith, and the first recording secretary, Mrs. A.A.H. Canizares. Through a happy coincidence, pictures of these three women taken during the first year of their term of office have been made available for use in today’s column. In 1921 Phillips and Phillips, prominent photographers of Philadelphia, assembled an album of pictures of such members of the Saturday Club as wished to have them taken. Among them are the three shown today, reproduced through the coutesy of the Saturday Club. Very often, as your columnist goes through back files of “The Suburban” for information on a particular subject of which she may be writing at the time, her eye is caught by an especially intriguing headline. So it was, a year or so ago, when she was searching for information on by-gone Christmas times in Wayne. In the December 1922 issue of the paper, a story entitled “Eleven Acres of Diamonds” caught her attention. It proved a fascinating tale indeed, particularly as those eleven acres lay not very far from Wayne. And now, 30 years after the original article appeared some reader of the column may be able to bring us up to date on “what happened next”. Throughout the story, these fabulous 11 acres are given no more definite location. The owner was “a modest and unassuming carpenter, Morris A. Barr” who at that time lived in “a little framed cottage at the end of the property.” One day in July, 1914, while he was walking beside a tiny stream that ran through his land, he noticed a number of “glittering sparks” in the rocks beneath the water. When he showed a jeweler in Ardmore pieces of this rock, the jeweler pronounced the “glittering sparks” to be gold. Since there had been several such finds in the general vicinity, this news was not so startling as it might have been. However, it was interesting enough for Mr. Barr to show various other pieces of mineral which he had picked to Colonel Henry C. Demming, at that time consulting mineralogist, geologist and chemist of the state of Pennsylvania. When the latter pronounced them precious stones, Mr. Barr began to realize the possibilities of the value of his property. He then determined to make a study of these specimens for himself and, later on, various lapidists confirmed the interesting discoveries he made in regard to the variety of these specimens. A state mineralogist, after he had visited and inspected the property, suggested that the surface soil containing the gems was originally hot lava belched forth by an erupting volcano. This would, of course, account for the irregular boundaries of the gem-filled land. The gold vein, which was of the “vertical variety”, was over 10 feet thick. The owner had never dug deeper than 15 feet, at least up until the time of the writing of the article. Although he had received various offers from persons who wished either to go into partnership with him, or to purchase his land outright, Mr. Barr had steadfastly refused to do anything about the development of his land. “It is a curious experience, savoring more or less of the unbelievable,” states the writer of this “Suburban” article of 30 years ago, “to visit this land of gold and silver and precious stones, to be led through thicket and shady copses that abound there, to be taken down to the banks of the merry little stream and have Mr. Barr, suddenly stopping, hold out a handful of quite ordinary pebbles and matter-of-factly announce ‘These are opals and sapphires and lapis lazuli.’ Then, perhaps he will point to the rows of corn and potatoes and onions that he himself has planted, and tell how, as he ploughed the ground, he turned up stone after precious stone, while his wife picked them up and put them in a bucket nearby”. In spite of the fact that all these metals and gems were assayed and tested by experts from various parts of the United States, Mr. Barr remained more interested in the spring of mineral water that he bottled and sold throughout this section than he did in his potential wealth. He attributed his own good health to the beneficial effects of this water. However, he did have in his office a small cabinet in which he kept samples of the various stones and metals, some cut and polished, and others in the rough state in which he found them. Some few of the stones he had set in rings, pins and lavellieres, which he sometimes sold to those who came to buy his mineral water. It is said that he never solicited such sales, however. If, among the readers of this column, any one can give additional information in regard to the exact location of Mr. Barr’s farm, or of any further particulars of what has happened to it during these past 30 years, Mrs. Patterson will be glad to publish this information. To your columnist, the highlight of Easter Sunday was her afternoon visit to one of the quaint old houses in this vicinity. 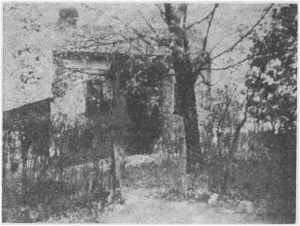 It is the former Wilds’ homestead, located on Upper Gulph road just at its intersection with Croton road. The original small house was built about 140 years ago by John Wilds and his sister, Sarah Wilds, and is now the property of Mrs. Kathryn L. Stinson. The house in its original state looked very much as it does in the first picture illustrating today’s column. The second picture is one taken by Mrs. Stinson during a light fall of snow in the winter just past. When a west wing was added in 1927, by Mr. and Mrs. Sidney Evans Wells, here was evidence that the original structure had been of logs, at least in part. But by the time the first picture was taken the house gave every appearance of being a stone structure. The first Wilds to come to this country was another James, the great-great-grandfather of the present James Wilds, who now lives on West Wayne avenue, but who, for some years, lived in the house just to the East of the old homestead, now occupied by Mr. and Mrs. Harry R. Tompkins. An old deed, still in the possession of the present James Wilds, shows that John and Sarah Wilds, a son and daughter of the first James, bought four acres of land in 1814, the purchase price being “150 silver milled dollars”. These four acres were a portion of a large tract of land belonging to Rudolph Huzzard, a blacksmith, that extended as far west as Old Eagle School road. Although there is no written record of the building of the present little old house, it was presumably done by John and Sarah Wilds soon after they bought the original four acres. Here John and his wife had a family of 15 children, although all did not live to maturity. It is interesting to speculate on this large family as one goes through the present house, so little changed except for the addition made in 1927. The most used entrance was undoubtedly that under the shed, to the left of the house, which led into the basement kitchen, with its 60-inch wide fireplace. The old iron cranes from which the cooking pots originally hung are still intact, and in this room much of the family living must have gone on. A narrow stairway leads to a room just above the kitchen and of the same dimensions. It is now Mrs. Stinson’s charming living room, with ruffled curtains at very narrow windows that at the back of the house are from ceiling to floor. By actual measurement the walls are 22 inches thick. In contrast to the basement room fireplace, the one here is so small that Mrs. Stinson has not been able to obtain suitable andirons for it. It is but one of the miniature features of this floor. At the foot of the stairway, leading to the floor above, is a cupboard that is only 14 inches wide, while the stairway itself is but 22 inches in width. One of the most charming spots in the present house is the bedroom just above the living room, with mahogany furniture and lavender and white ruffled curtains at the windows which, although they are small, still let in much of the southern sunlight. The eight feet which the Wells family added to the west end of the house is taken up by a small cheery kitchen at the back of the first floor and an even smaller bathroom in front. Above, on the second floor, is a room which can be used as a bedroom. Mrs. Stinson is herself responsible for much of the interior decoration, which is as charming as it is simple. The modern oil heating system is adequate for any cold winter day, and certainly far superior to that furnished by the two original fireplaces. Floors throughout the house have the original very wide boards held in place by “top” nails. Beamed ceilings have become a soft-toned brown with the passing years. The lock on the kitchen door consists of the original wooden slide, still so strong that entrance could not possibly be forced from the outside. At one time water was pumped into the kitchen from a deep well near the door. This house, which in many ways is a veritable “doll house” in size and charm, is surrounded by about an acre of ground, with several fine old trees and some nice planting. At the back border line is a rock garden, which is being rapidly restored to its original beauty. Mrs. Stinson, a real lover of flowers, was the proprietor for a short time of the flower shop in Paoli. For more than 100 years this little house remained in the unbroken possession of one generation after another of the Wilds family. The last to be there were Mr. and Mrs. Isaac Wilds, parents of the present James Wilds. The latter sold to Mr. and Mrs. Wells, who made the only building changes the old house has ever known. Among others who have since lived there are the Richard Bards, the James Rices, the Wayne Millers, the Fronefield Crawfords and the Gordon Brooks. In the 1880’s and early 1890’s, the late James B. Morrison, one of North Wayne’s old-time residents, took a number of pictures of historic spots in Radnor township as well as in the vicinity immediately adjacent to it. For the August 15 issue of “Your Town and My Town”, four of these pictures were shown. The originals of these pictures were lent to your columnist by F.G.Farrell, of the “Book and Yarn Shop”, Wayne, nephew by marriage of Mr. Morrison. 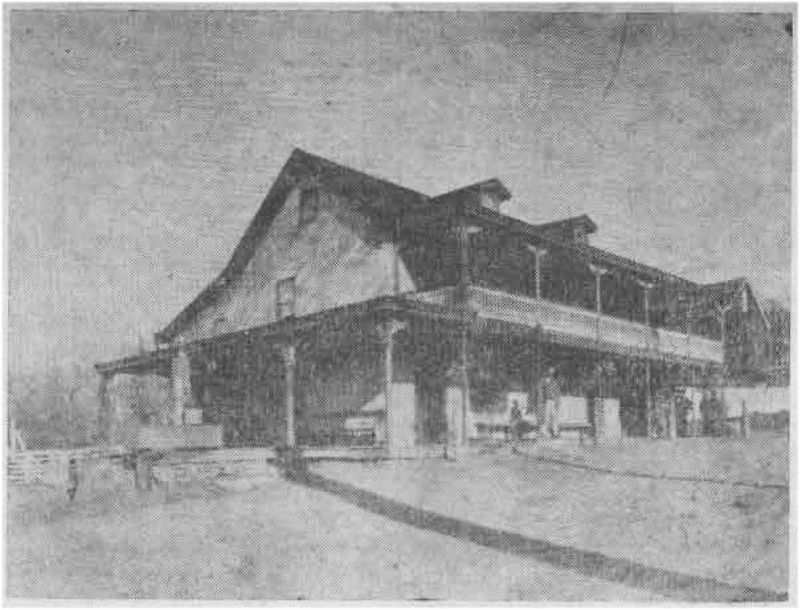 For today’s column Mr. Farrell has lent two pictures of ancient taverns in the neighborhood. 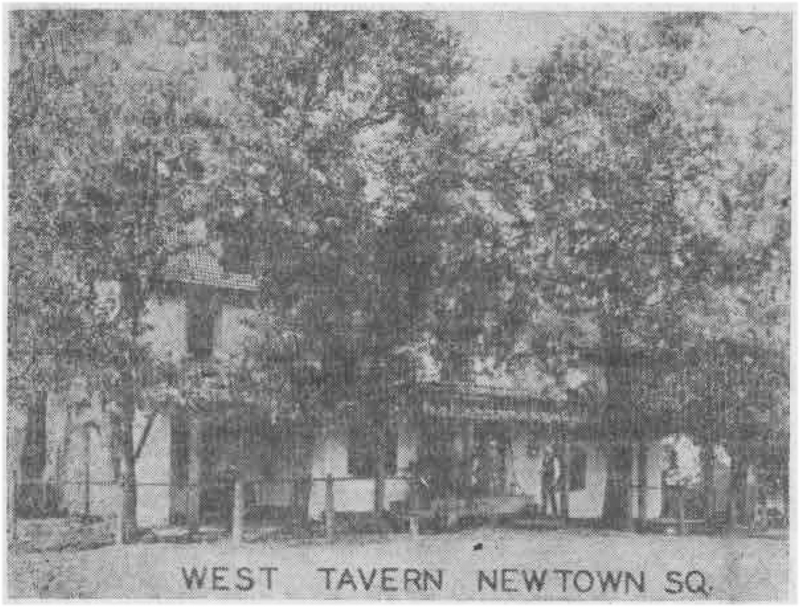 The first is the old West Tavern, in Newtown Square. The second is that of one of the two “Sorrel Horse Inns,” on Conestoga road near the little settlement of Ithan. The again, in 1755, John West became “mine host” at the inn, remaining there for three years in the second venture. 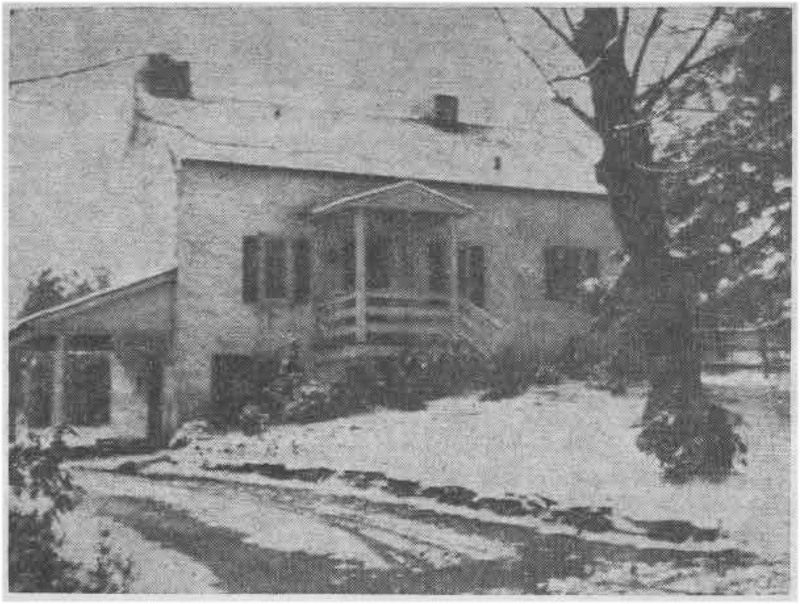 The old tavern, which at various times was known by different names, according to ownership, became in 1823 the polling place for the electors of Newtown, Radnor and Marple townships, as well as part of Edgmont, according to the historian, Ashmead. 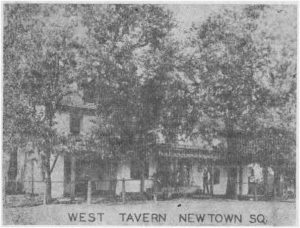 Known as the Newtown Square Inn in the 1850’s, the old tavern had evidently assumed the name of the family made famous by the painter, Benjamin West, when the accompanying picture was taken some years later. Much confusion has arisen of late years in regard to the name “Sorrel Horse Inn” and to its location. This is probably due to the fact that the original tavern of that name, after it had ceased to function as such, became a farmhouse. It was then that another tavern in the immediate neighborhood, but without its predecessor’s historic background, took over its name. Amy Oakley, in her charming book, “Our Pennsylvania”, recently published, refers to the first old inn as “the hoary Sorrel Horse, at Ithan, which was built in 1768 and often sheltered Washington and Lafayette.” During a pleasant visit which your columnist made recently to “Woodstock”, Mr. and Mrs. Thornton Oakley’s Villanova home, Mrs. Oakley told the stories of these two taverns, well-known to her because of their proximity to the Ewing farm, her ancestral home. “Woodstock” is indeed the remodeled barn on this farm. Sorrel Horse Hill extends from Ithan avenue to where once stood the second Sorrel Horse Tavern. At that time the ground it occupied adjoined the farm of J. Hunter Ewing, Mrs. Oakley’s father. As time went on the tavern’s reputation became such that it lost its license. A Number of Radnor township’s older residents remember when the building still stood before it was finally torn down. Its appearance was quite different then from that of the neat edifice with its spacious first and second story porches shown in the illustration accompanying this column. Its approximate site is now occupied by the home of Mrs. George L. Justice.